Vitamin B complex from a completely natural source. Did you know that vitamin B complex is comprised of many different B vitamins? Maintains beautiful and toned skin and slows down the signs of ageing. Ensures faster and healthier hair growth and gives it an extra sheen. Ensures healthy and strong nails that don’t break. Maintains gum, teeth and bone health. Protects our body from oxidative stress that accelerates our ageing. Contributes to good blood count (it helps red blood cell (haemoglobin) production). Stimulates nervous system function and regulates thought processes which is especially crucial during times of increased mental demands. Prevents tiredness and lack of energy and helps you feel good. Has an important role in optimal hormone production and function. Regulates heart function and ensures cardiovascular system health. Contributes to optimal immune system function and protects your health. Who needs extra vitamin B complex? Individuals who don’t eat meat can’t get the full vitamin B complex from their diets. Vitamin B complex stimulates nervous system function and regulates thought processes which is especially crucial during times of increased mental demands. Our fast-paced life is often the main source of stress. Vitamin B complex will ensure normal nervous system function and a clear mind even in the most stressful of situations. Vitamins of the B complex contribute towards optimal immune system function and reduce feelings of tiredness and exhaustion. You can prevent or get rid of anaemia with the help of vitamin B complex because it raises haemoglobin (red blood cells) levels. 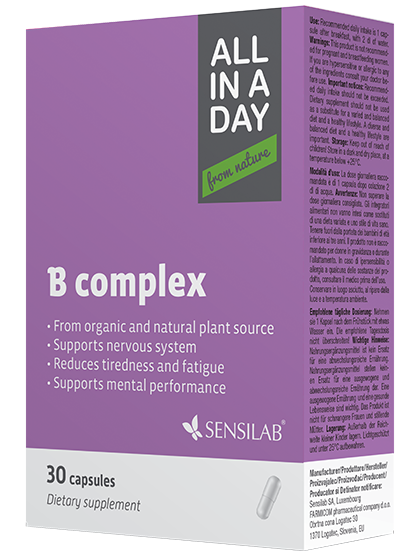 Vitamins of the B complex slow down the signs of ageing. They also ensure fast and healthy hair and nail growth. Why can’t we get enough of it through food? We can get vitamins of the B complex from food. Some natural sources include yeast, egg yolk, fish, bell pepper, walnuts, whole fat cow milk, spinach and lemon. But because numerous vitamins and minerals are eliminated from our bodies through urine and sweat daily, we have to keep the vitamin supply steady. At the same time, whatever we buy at the supermarket doesn’t contain a lot of nutrients because our groceries have travelled many kilometres to reach us – and they’ve lost most of their vitamin content in the process. Every mechanical processing also reduces vitamin content in food: when we peel, cook and mash potatoes, we lose more than 50% of vitamins, minerals and other nutrients that were in there before. Where does ALL IN A DAY B complex come from? Since vitamin B complex cannot be made by our bodies, we need to get it from food or supplements. We have sourced our vitamin B complex from organically grown guava, holy basil and lemon - all an exceptionally rich in natural vitamin B complex. These three plants contain an outstanding combination of B complex vitamins (B1, B2, B3, B5, B6 and B9). All of them only have beneficial effects, among them are: maintaining a healthy body, stimulating cognitive processes and keeping skin, hair and nails healthy. 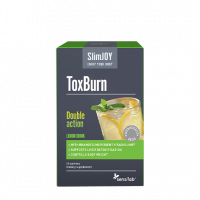 is absorbed quickly and starts working as soon as you take it. INGREDIENTS: bulking agent: corn dextrin, blend of guava fruits, holy basil leaves and lemon fruit peels extracts with all-natural B complex vitamins (pantothenic acid, niacin, thiamine hydrochloride, pyridoxine hydrochloride, riboflavin and folic acid), anticaking agent: rice concentrate, capsule: hydroxypropyl methylcellulose. USE: The recommended daily intake is 1-2 capsules with a glass of water after meal. WARNINGS: If you have a known sensitivity or an allergy to any of the ingredients of this product or are taking any medication, please consult your doctor before use. The product is not recommended for pregnant or breastfeeding women. IMPORTANT: The recommended daily intake should not be exceeded. The dietary supplement should not be used as a substitute for a varied and balanced diet and a healthy lifestyle. A diverse and balanced diet and a healthy lifestyle are important. STORAGE: Keep out of reach of children! Store in a dark and dry place at a temperatures below 25°C. The ALL IN A DAY makes it easier for your body to reap the benefits of vitamins, minerals and nutrients obtained from more than 22 natural sources. With their help, everyone now has a chance at a vital and carefree life. Vitamins, minerals and important nutrients from unprocessed plants and minerals (GMO free) ensure fast and reliable effects. Because they are all taken from nature, obtained through non-aggressive processes and do not contain any synthetic additives, our body recognises and absorbs them more readily. Since the capsules are plant sourced, made from pure cellulose and free of dyes, they are easy to digest, gentle to your liver and stomach and vegan and vegetarian friendly.